Groupe Country US formé en 1974 à Los Angeles (Californie), composé de Don Parmley, David Parmley, Larry Stephenson, Mike Hartgrove et Dale Perry. Ancien membres : Norman Wright et John Davis. Bluegrass Cardinals s'est dissous en 1997. 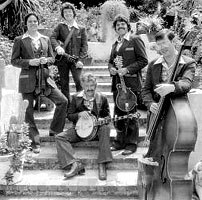 The Bluegrass Cardinals came together in Los Angeles in 1974 when banjoist Don Parmley and mandolinist Randy Graham teamed up with Parmley's 15-year-old son, David, to form what was to become a successful bluegrass trio who wielded considerable influence from the latter half of the '70s through the early '90s. Don Parmley and Randy Graham's partnership had preceded the official start of the band by seven years when they started a musical friendship after the demise of Parmley's previous group, the Hillmen (whose leader, Chris Hillman, found success as a member of the Byrds), and so it seemed natural to grow into a trio with the addition of the younger Parmley. In 1976, the three moved from southern California to Virginia and cut their self-titled debut album for Sierra Records, followed by their 1977 Rounder offering, Welcome to Virginia. These two albums quickly cemented the oft-described "Cardinal sound," which dealt mainly with the intricate harmonies centered around David Parmley's lead Vocals, his dad's baritone, and Graham's high tenor. Almost off the bat, the Bluegrass Cardinals shuffled through countless lineups and proved a springboard for many bluegrass musicians, including fiddler Dennis Fetchet, bassist Bill Bryson, and mandolinist Larry Stephenson. They recorded several albums in the late '70s and early '80s for the CMH label with these and a slew of other fine musicians as well as making several appearances on the Grand Ole Opry before settling with Sugar Hill Records for three albums between 1983-1986. In 1991, Don and David took a short hiatus to record Parmley and McCoury — Families of Tradition with Del McCoury and his two sons, Ronnie and Rob McCoury, and by 1992, David chose to leave the Cardinals and pursue his own solo career. He recorded three albums under his own name and then reunited with original Bluegrass Cardinal fiddler Randy Graham in 1995 to form the Continental Divide. The Bluegrass Cardinals continued on until 1997, when Don Parmley announced his retirement from the music business. In late 2002, CMH Productions released a collection put together by David Parmley titled The Essential Bluegrass Cardinals.